I've never cared much for the expression, "He / she wears many hats." I often associate it not with someone having multiple gifts but rather with someone having too many obligations. Numerous responsibilities are part of any vocation, relationship, and community. Fulfilling those responsibilties, however, can quickly become serving too many masters. As a college freshman, I recall serving many masters in a search for my calling. There was no more apt illustration of my scattered interests than my shoe collection. At the age of 18, I owned 40 pairs of shoes. During Advent of 2012 I wrote a reflection about how clearing the clutter of those shoes brought clarity not only to my closet but also to my spirit. My college years helped me narrow my focus, and reduce the shoe collection, to a reasonable number. For the past two Sundays, shoes have been on my mind again. Every Pentecost Sunday I brave high heels and put on a bright red pair to celebrate the coming of the Holy Spirit. The following week, on Trinity Sunday, I stepped into a shoe I'd never worn. 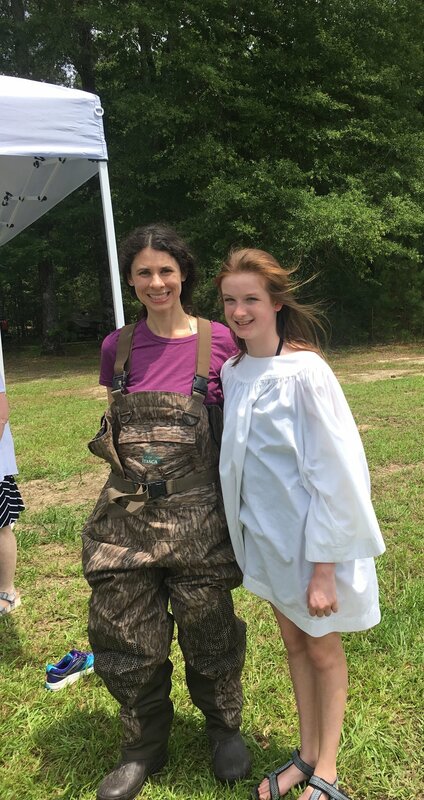 One of our previously unbaptized confirmands wanted to be baptized in a lake rumored to contain snakes and snapping turtles. While she had no fear or trepidation, I was praying that the Holy Spirit of Pentecost had indeed given me "the authority to trample on serpents and scorpions, and over all the power of the enemy," and nothing would by any means hurt me (Luke 10:19). God answered my prayer in the form of "waders": these overall-boot combos that are a common sight among outdoor lovers in Mississippi. I borrowed a pair from a church member and came through the baptism unscathed. As I posted photos of the red high heels and camouflaged waders on social media, I thought about the ways pastors wear not many hats but rather step into many shoes. Some are shoes we choose, and others are shoes designed for a purpose we'd rather avoid. All of the shoes equip us to serve one Master. Scripture often aligns our feet with peace, as prophesied by Simeon over the infant Jesus. To take off running in a pair of unfamiliar shoes will likely leave us flat on our faces. Some shoes work better than others, reminding us that not every pastor should wear every type of shoe. (I don't need to wear waders regularly, but some of my colleagues certainly could!) We have to find the right fit. We need to take our time. We must remain open to the paths where God leads us, trusting that God will give us the appropriate shoes for those paths. Let's start paying attention, pastors and laity alike, to the shoes we choose each day. May something so simple that we often take for granted remind us not to be so scattered. May we focus on the peace our shoes can bring go this day. Let's step up to a higher calling by following the footsteps of our Lord Jesus Christ.